With unannounced gales beginning before dawn, the 16th wasn’t a day to be walking amongst the reserve’s trees. 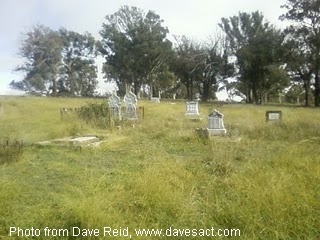 Instead we walked west from Dungowan Street towards Weetangera Cemetery. There’s a broad swathe of grass between the paddocks and the large gardens of Hawker’s westernmost streets. The mowing regime seems back on-track and the householders have magnificent views into the lower Molonglo valley and towards the Brindabella Range. The rank, introduced grasses contain a mix of species which were probably sold to graziers as “pasture-improvement” grasses. Their removal is now the subject of the native grassland restoration project (GREAT) which has occupied many volunteers from fotpin in recent months. The Pinnacle reserve has many native grass species which are currently out-competed by introduced species such as those we saw. Our walk showed how readily mowers bring major invasive species such as African love grass and Chilean needle grass into reserves’ high conservation areas in spite of mower-hygiene procedures. Fencelines, poles, barriers and embankments support un-mown grass and there’s an interesting range of tall shrubs and trees closer to the underpass that allows pedestrians, horses, cyclists and walkers to cross under William Hovell Drive. Most of the gardens whose boundaries back onto the Bicentennial Horse Trail show that their owners have carefully considered what should be left in the seventies-gardens they’ve inherited. There are very few specimens of environmental weeds such as Cotoneaster, Privet and Hawthorn which were free-issue plants in those days; berried plants which have given ‘Environment ACT’ staff, Parkcare, fotpin and Landcare volunteers years of hard work ever since. With the wind behind us we spent more time enjoying the views and the open scenery than musing over weed-threats. There was the familiar bluish-haze over the hills, a reminder of the presence of countless eucalypts whose vapours are said to produce this effect. Where we could see the paddocks and their scattered trees we thought of the hours of toil that resulted in the land’s trees being cleared for stock and farming. With cattle visible and the occasional farm dam it’s quintessentially rural Australia and within 15 kilometres of Canberra’s CBD. The cutting that was made for William Hovell Drive has the effect of hiding the cemetery’s presence from drivers who are passing at 80 kph. Access is not easy as the paths are obliterated by long grass. There’s a farm gate at the entry with an old-world Cypress tree on each side. A cracked, but not dead, branch blocks the obvious entry unless visitors are agile. The trees may be Mediterranean cypress. They’re not related to The Pinnacle’s Cypress Pines other than being coniferous. The shade beneath the trees is deep, and fallen leaf-material inhibits the growth of low-growing plants. It’s possible that planting these trees gave the local people links with the English tradition of having Yew trees at the entrance to churchyards. In earlier times, we were told, those seeking sanctuary in churches could venture out to gather yew branches to make long-bows. Beyond the two trees is a rough cairn which marks the site of Weetangera Methodist Church. There was a plaque to that effect but it has been 'souvenired'. The church was built from timbers carted from an under-used church in Lyneham. By 1955, after 83 years of use for worship, weddings, baptisms and funerals the church was demolished. The graveyard has over forty graves. Many are unmarked. Others have headstones which reveal a wealth of social history and the anguish death brought in those harsh times. To our astonishment we had to walk through a sea of Weeping grass, Microlaena stipoides, as we moved towards the graves. The season has been so good that the cemetery wasn’t needed for grazing sheep and the native grass has taken advantage of its freedom. Like many native grasses Microlaena flourishes in late summer, being green when introduced grasses present as fire-hazardous. Microlaena is one of the grasses that’s growing through the debris from scything and cutting the Pinnacle’s saffron thistles. With that debris as protection any young plants will have a chance of maturing rather than being grazed by kangaroos. Using coarse debris in this way is one of the principles of erosion control that can be applied in drainage-lines. Under the remaining large eucalypt trees of the cemetery’s two acre site there were many Black nightshade plants. Solanum nigrum has grown well in many areas this season. The species, a cosmopolitan weed probably from Europe originally, has been labeled poisonous but in other parts of the world it has uses as an occasional food and medicinally. Sources here label it as poisonous to cattle, sheep, pigs and poultry. The berries are more toxic when green and sometimes young children are attracted to the black, ripe berries. Fotpin’s weeders have targeted the plants. I wonder if any birds have been seen eating the berries? In other words how are the berries spread? Our return walk was perhaps more pensive as we reflected on the contrasting lifestyles around the 1870’s and now. Quite a few commemorations listed the dead as being old even by our standards. In spite of very physical lives they seemed to have been healthier than many of us! I couldn’t help hoping that the iconic views from the cemetery and from the Bicentennial trail would remain for future generations and not be lost in the rush to convert Canberra to an ‘normal’ city. Should anyone wish to learn more of small farmers’ and selectors’ lives in those pioneering days Samuel Shumack’s An Autobiography or Tales and Legends of Canberra Pioneers is a good place to start. At fifteen, with his father, Samuel took up a selection at ‘Weetangerra’. He farmed there until his land was resumed in 1915 in preparation for the development of Canberra.